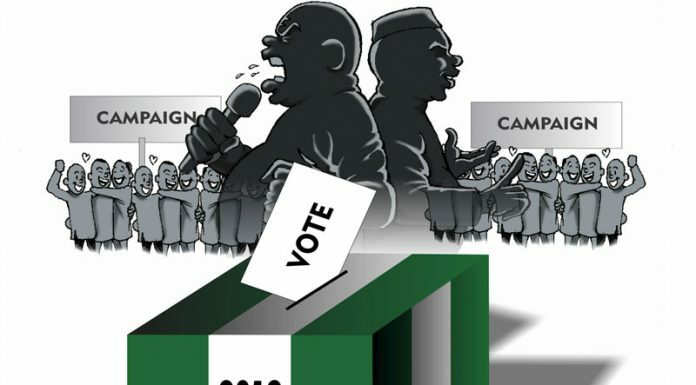 Perhaps, it is by sheer providence that on the 20th edition of the THISDAY Guide to the 2019 elections, the first round of elections â€“ the Presidential and the National Assembly polls â€“ are exactly 20 days from today. That election is slated for February 16 and the next round follows immediately on March 2. And because the date is fast approaching, events leading to the elections have also picked up significantly. Therefore, of all weeks, the one under review witnessed a flurry of activities, many of which are considered threats to the goal of a credible poll. President Muhammadu Buhari suspended the Chief Justice of Nigeria (CJN), Justice Walter Onnoghen and immediately appointed in his place, Justice Tanko Mohammed. Unfortunately, his action has attracted scathing criticisms from all over the world with the governments of the United States and the United Kingdom, as well as the European Union condemning his brazen disregard for the constitution. But as if the US and the UK governments had the inkling about the possibility of interference in the election, they had earlier in the week warned of undue interference in the process and threatened visa ban on anyone found wanting. Meanwhile, some of the candidates running for election had dragged the Independent National Electoral Commission (INEC) to court over the election guidelines. They took exception to some of the provisions in the guidelines and sought amendments. Also, some ex-officials of INEC were in the week sentenced to 64 years in prison over N264 million gratification. But as bad as that may sound for INEC, it is the belief that it would send some right signals to others and deter them from activities that could undermine their responsibility and expectations. But the electoral body has continued to campaign against vote-buying even as it is constantly discovering new ways of doing so. These aside, the campaigns continued last week with the PDP mostly doing anti-Buhari campaigns. The party, in fact, warned against the implications of re-electing Buhari. In view of this, the PDP presidential running mate, Peter Obi stormed Lagos in the week and was at the Computer Village to sell their candidacy to the people. APC too has been going round. However, in spite of the mixed feelings that trailed his recent intervention on the state of the nation, former President Olusegun Obasanjo has continued to campaign against Buhari and solicit for votes for his candidate and former deputy, Alhaji Atiku Abubakar. In all of these, the dynamics in the states with respect to interests and the power play have continued to scale up, albeit with hazy possibilities of what is obtainable from state to state. Yet, some states have remained constant on the chart. Abia is one of South-east states, where extreme supremacy battle would be witnessed and the tenor of campaigns is daily exposing the antics and confirming the undercurrents. With a former governor of the state, Orji Kalu gradually holding down his end of the stick in the resolve to deliver the state, the battle for Abia North Senatorial district is increasingly getting clearer as if a no-contest between the former governor and the incumbent, Senator Mao Arukwe Ohuabunwa. Although for Kalu, this is a battle of relevance hence the slanting of his campaign to flaunt the admiration of his people by reliving his achievements while in office, particularly encouraging them to insist that since other states are fielding former governors for the senate, then, there would be no alternative to him. He has really done a good job getting the people behind him and locking down their support. However, while Abia North could be said to have been secured by the opposition APC courtesy Kalu, the situation in Abia Central, where another former governor, Theodore Orji is the serving senator is a battleground between the APC and the PDP. There is a tinge of religious slant here as the area is believed to be predominantly Anglican and thus, the fielding of Nkechi Nwaogu is meant to neutralise him and give the APC some favourable push. What obtains here is not solely in favour of either of the parties but a victory for whoever is able to push more beyond the current stakes. The seat is take-able. In the South, however, where Enyinnaya Abaribe is the incumbent senator, also the part of the state where the governor, Okezie Ikpeazu comes from, the PDP still holds strong here. But the APC is not giving up even though it is aware the PDP is popular here. It is also for this reason that the APC has fielded a former Managing Director of Hallmark Bank, Marcus Wabara as its candidate. Even in some House of Representatives seats, the APC has fielded individuals with name recognition and war chest. Such persons include Mascot Orji Kalu for Abia North and South; IK Apugo, the son of Chief B.P Apugo for Umuahia South, while returning Nkeiruka Onyejiocha for Isuikwato/Umunneochi. The APC is therefore putting out its all for the first round of the election with a view to getting ready for the second bout. But the PDP is believed not to be oblivious of these dynamics and is ready to battle fire-for-fire on February 16. Even the most cynical of analysts would freely tell anyone that Enugu is one South-east state that has remained solidly PDPâ€™s and therefore impregnable. In addition to that is the fact that the incumbent governor, Ifeanyi Ugwuanyi is running on a stellar record, therefore, making the work of the opposition APC genuinely uneasy. What more, the governor has remained incredibly calm and cosmopolitan in the face of undue provocation, allegedly by the opposition. Rather than exert authority and pull its full weight on the opposition, he has been, on the contrary, persuasive, urging civility in every political engagement. This perhaps is believed to have been responsible for his many endorsements. But these notwithstanding, the ruling party might have problem in Enugu West senatorial district, where the incumbent Deputy Senate President, Ike Ekweremadu has held sway since 2003. Now, some people from another part of his senatorial district are clamouring for change, insisting he has stayed long enough. And this part of the district is believed to have the larger voting strength, thus compounding the Ekweremadu situation. Although analysts see the situation in that part of the state as between 45 and 55 in favour of Ekweremadu and the PDP, there are however fears that if he did not buckle up, his political career might â€˜kiss the dustâ€™ to his shock. The opposition has seen this loophole and desperately cashing-in on it. In South-east Ebonyi, where Governor Dave Umahi currently holds sway, there is a looming battle between him and Senator Sunday Ogbuoji of the PDP. There is no doubting the fact that the governor is running partly on his record and also on the full weight of incumbency. Interestingly, he has a formidable challenger in Senator Ogbuoji, who is the candidate of the APC with strong and die-hard followership and equal support strength from the centre. Thus, while analysts still peg the contest to between 60 and 40 in favour of Umahi, they believe that the 40 per cent concession to Ogbuoji cannot be underestimated and could change with time. As a result, the battle in the state is staring all in the face and certainly not going to be a walkover for the governor, either to sustain his current percentage or increase it, otherwise, the opposition appears desperate to decimate his current rating and overtake him. The jury is still out here. Imo presents a special case study in the battle ahead. Here, there are too many contending forces for all the categories of elections. These interests include Governor Rochas Okorocha; his son-in-law, Uche Nwosu; governorship candidate of the APC, Hope Uzodinnma; governorship candidate of APGA, Ifeanyi Ararume; governorship candidate of the PDP, Emeka Ihedioha and the governorship candidate of Accord Party, Ikedi Ohakim. Looking at the roll call, each of the contending interests is strong in their areas and holds it down as such. What this means is that except for a strong alliance, there is none of the candidates that can effectively achieve the required percentage for a smooth victory in the state, especially in the governorship race, because there is the expectation that they would all vote their choice presidential candidates in February. But in the March 2, governorship poll, what is likely to happen is that there may not be a winner in the first ballot, a development that would propel high wire intrigues and possible alliances in the second ballot. And knowing the Imo brand of politics, the least likely candidate always emerges governor, but as a product of negotiations and alliances. The state might be tilting towards that spot again as the nation counts down to March 2. The recent intra-APC power play, which followed the suspension Uzodinnma and the dismissal of it by the national leadership of the APC hints aptly at what lays ahead. The battle in Anambra is basically that of presidential bout and it is about consolidation of their current status by all the major actors. For instance, Governor Willie Obiano, although the greatest beneficiary of Peter Obiâ€™s magnanimity, has never hidden the fact that he would mobilise support for Buhari. He is currently running on his second term ticket. However, after eight years in the saddle and having failed to stop Obianoâ€™s re-election, the February 16 election provides Obi another opportunity to prove his worth in a state he rode like a colossus for eight years. Interestingly, there is a new campaign against APGA now, which makes it literally difficult for Obiano to claim ownership of the state. The campaign is that APGA is not an Igbo party but Anambra party. In context, it behooves either of them to prove this right or wrong by effectively mobilising their people, either for their own or someone else. At least, the one point they have consistently raised in support of this campaign is that they cannot claim it is an Igbo party and deny the wife of their deceased leader an opportunity to go to the Senate. This battle is raging and Anambra will have to settle this once and for all. Very much like its character, the court is currently the problem that Zamfara APC has to deal with as it faces a rather bleak future in the emerging dispensation. The party, which failed to produce candidates for any of the elective offices following its contentious primaries, is desperately seeking to get back on the ballot. Unfortunately, its case is purely legal and guided by time as provided for in the Electoral Act. It was based on this that INEC said by missing the deadline, there was nothing it could do to help the party in the state. The development had also become a subject of politics as the opposition continued to warn INEC to not bend the rules. But last week, there were two conflicting rulings on the plight of Zamfara APC. While the first asked INEC to recognise candidates of the party, another gave a contrary ruling. This is what the party has continued to deal with and from all indications the result of this uncertainty is expected to manifest in the February 16 elections. With each passing day, the Allied Peoplesâ€™ Movement (APM), party of Hon. Adekunle Akinlade is becoming the issue in Ogun State. Not just because Akinlade is Governor Ibikunle Amosunâ€™s choice candidate, but because he has taken up the challenge himself, and facing the fire power of the opposition without having to be chaperoned. By selling the right message at the right places, Akinlade is believed to have raised the ante of issue-based debate, coupled with elevated understanding of what the issues are. Perhaps, like some reckon, he has been able to mobilise war chest through friends and supporters and therefore able to prosecute his campaign effectively. Although the opposition parties are also holding down theirs, it does appear the threat of a legal suit recently instituted by Chief Iyabo Anisulowo against Mr. Dapo Abiodun has not stifled him from taking the bull by the horn. He however has an even bigger challenge in the person of Seantor Buruji Kashamu of the PDP, being from the same Senatorial district, the same way Mr. Gboyega Isiaka is Akinladeâ€™s biggest challenge. One of the North West states that might find it difficult riding on the weight of incumbency is Kaduna. With a legion of enemies â€“ both within and outside the party â€“ Governor Nasir el-Rufai is not enviable at this time. This is further compounded by the security challenge that has remained present even before his coming to power. Thus, when this is combined with the enemies he chose to make, particularly in the three senators from the state, then, the election in Kaduna goes beyond the Chief executive; it is going to be about how much of influence everyone commands and how they are able to leverage such influence and ensure it could be translated into electoral mileage. It appears those after outgoing Governor Akinwunmi Ambode, are not done yet. Yes, they had denied him the privilege of returning to power this year; they had asked him to let go off his bitterness and support the new man on the block and of course, they had begun to issue new orders, all of which he has continued to carry out, including some recent appointments. However, there was a corollary to denying him re-election ticket and that was also sending him packing. Unfortunately, for his traducers, that has remained a tall order. But back and forth, they have refused to permanently close that chapter and thus, it remains the unfinished business of the owners of Lagos. The latest, interestingly, is the refusal by the state House of Assembly to allow the governor present his 2019 budget estimate, many weeks after he had notified them. Even when they raised his hope last Monday, they merely kept him waiting for hours and looked the other way. There have been questions genuinely asked about what the lawmakers stand to gain from this, more so that they are of the same party and in the thick of an election. It is simply not adding up hence all eyes on the assembly to monitor what becomes of the matter ultimately. Senate President Bukola Saraki knows that this election is probably one of the few that would shake him and also take its toll on the dynasty. He has fallen out with the ruling party and is at war with the partyâ€™s intolerant fraction. If he ever had a doubt about what the opposition in the state had in stock for him, the result of a recent bye-election must have sent a strong signal. The thing is that Saraki is innately smart. Much as these challenges stare him right in the face, he has continued to ponder ideas on how to surmount them. That aside, he is also proving that he knows Kwara and its intricate politics. It was therefore not surprising that he recently struck a deal with Kwara North. He had been on the deal for a while but the opposition, perhaps out of concern, had tried to undo the plans. The people, of course, want to have a governor of their extraction and after their arithmetic, came to the realization that running with Sarakiâ€™s PDP was their best short. Thus, with a serious alliance between central and north, while south remains the battleground, the election is definitely a walkover. The pall of uncertainty that is currently hovering on the turf of River State is ideal for some political case study. Rivers APC has had to face serious legal battle within over the choice of primaries that produced the current executive in the state Flag-Ojukaye Amachree. And at each level of the legal engagements, the faction loyal to the Minister of Transportation, Rotimi Amaechi always lost. But finally, the matter is at the Supreme Court, the outcome of which would determine the future of the APC in the state. However, even if the Supreme Court ruled in favour of the APC, it would still have in the person of Senator Magnus Abe, an adversary that would not go away, even if there was intervention at the highest level to watch this go away. It is also not unexpected that the name of Governor Nyesom Wike has consistently come up as the one clandestinely leading the onslaught against the APC in the state. For him, it is about survival and deploying everything in his arsenal and at whatever cost, he would. The space for the presidential bout was surprisingly narrowed a little when candidate of the Allied Congress Party of Nigeria (ACPN), Mrs. Oby Ezekwesili, opted out of the race. Although other candidates like Fela Durotoye, also expressed his willingness to stand down and form alliances of and when necessary. But what the political space lost in the exit of Ezekwesili it also gained back in the recognition of Mr. Donald Duke as the presidential candidate of the Social Democratic Party (SDP), after an initial brush with Professor Jerry Gana, who was first recognised by a lower court. Meanwhile, the presidential campaign has continued from the two political parties, traversing the length and breadth of the country. With the countdown already, next week definitely promising to be more intriguing.